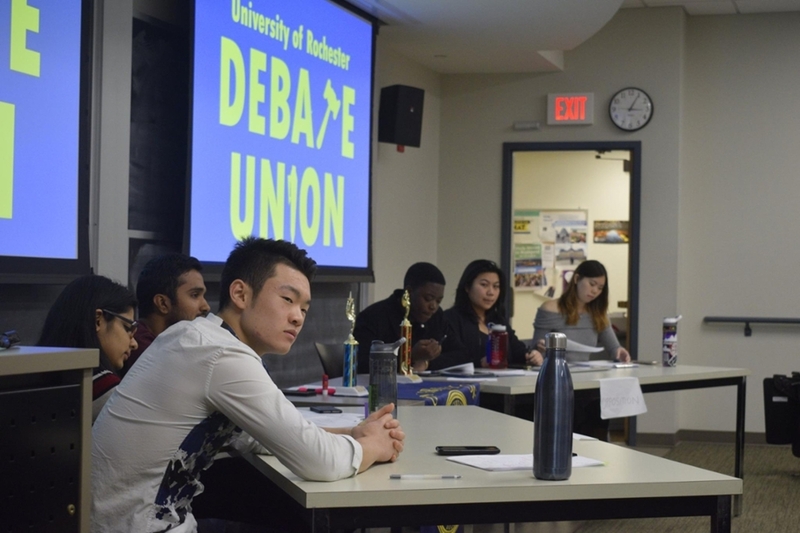 The University of Rochester Debate Union was established in 1850. 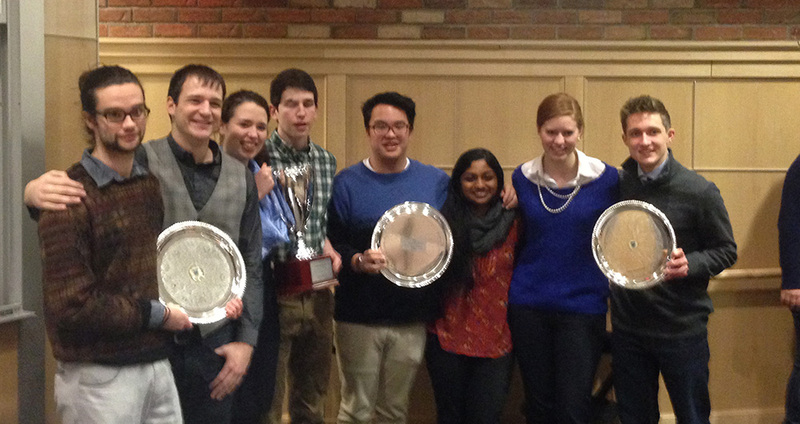 We are an intercollegiate debate team that supports two formats: Policy and British Parliamentary debate. We compete at regional, national, and international competitions, and participate in Cross Examination Debate Association (CEDA/NDT), American Debate Association (ADA), and Worlds Parliamentary sponsored activities. See the “Schedule” section for our travel plan for the semester. Please read below for more about debate, and then come and find out more about what we do by joining us for a meeting in our office, Dewey 1-204, on Mondays and Thursdays at 7 p.m., or contact Brady Fletcher, Director of Forensics, at brady.fletcher@rochester.edu. All are welcome! A Policy or "Cross Examination” Debate" involves two teams of two speakers who debate either in support of or against a resolution. Each year a new resolution is chosen. The resolution for 2014-2015 is: The United States should legalize all or nearly all of one or more of the following in the United States: marijuana, physician assisted suicide, prostitution, online gambling, the sale of human organs. Policy debate makes use of evidence drawn from books, scholarly articles, and government reports through research to support arguments for and against the year’s resolution. Students introduce the evidence, analyze it, and attack the other team’s evidence to articulate arguments that will win the debate. Aside from teaching general debating skills, your coaches will teach you how to perform the necessary research, and how to make use of evidence in strategic ways to win debates! A British Parliamentary or "Worlds" Debate involves four teams of two students who debate either in support of or against a motion that is announced 15 minutes before the round begins (making it an “impromptu” debate activity). Thus the activity requires a great deal of broad research across many different areas of focus, and especially a keen awareness of current events. Your coaches will teach you ways to keep abreast of the news while performing more in-depth research about historical and philosophical topics – and, of course, how to debate like a true Parliamentarian! We travel by van, bus, plane, and train to debate competitions all over the world. A debate tournament can last anywhere from a weekend to a week, and brings students from many different colleges and universities together to compete against each other. New members are always encouraged to start out by traveling to a regional tournament, because one can only learn how to debate by debating! Please see the “Why Debate?” section of this site for more information about why debate is great!